Redline 10x TS3000 HD Digital Satellite Systems launched its new innovation with faster 667Mhz processor. 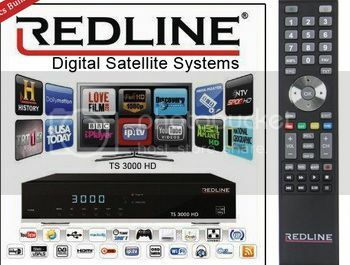 Redline Ts3000 HD have same functions as T7600 HD have. Additionally most popular Youtube and IPTV added in Redline Ts 3000 HD. Ts3000 satellite receiver combines HD and SD satellite reception, excellent high definition picture quality a MultiCrypt CAM. PVR recording to external drives and multimedia playback for an exceptional price. Redline HD receiver have Media Centre which includes N32 Sites, Photo Sites, Google Maps, Weather Forecast, Bit Torrent, Mackolik, PC Link. Internet connection is require to enjoy all these amazing features. Software and channels database transfer via usb or the disk shared in Lan. Redline Ts3000 supports several movie file formats stored on external USB- connected drives like, AVI, VOB, MPG, DAT, FLV, DIVX, REAL VIDEO, MKV. Music files supported formats are MP3, WMA, and ReaL Audio. Ts3000 Satellite Systems contains five highly enjoyable games, Boxman, Tetris, Hit Rate, Go Bang and Sudoku. Comes with CA, EMU, Newcs, CCcam, Redcam.